EOSToolKit – Proxy Integration, Referendum Voting, Voting portal plus more! GenerEOS are introducing a bunch of new features on EOStoolkit.io! We have been working hard to add new and innovative features on our toolkit over the past two months such as the Airgrab function and Poorman tokens. 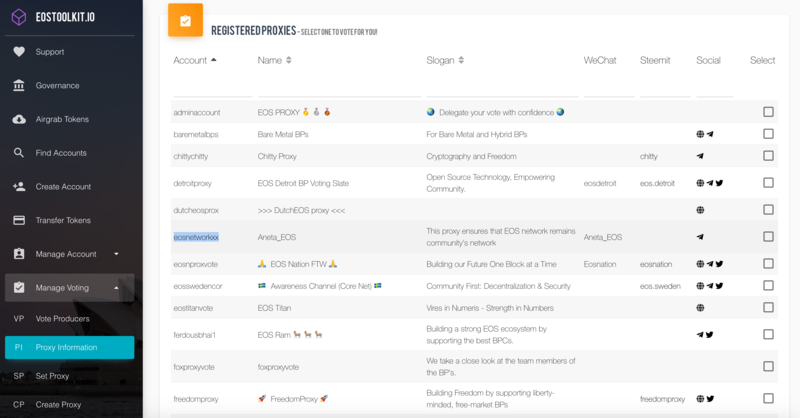 Now we are proud to announce that we have added our very own Voting Portal, Registered Proxy Integration, Referendum Voting and Account Information bar into EOSToolKit. 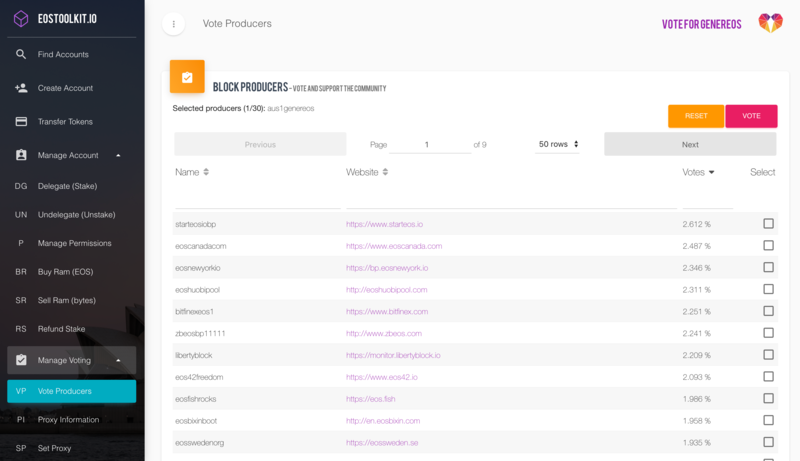 Our voting portal now lets you vote for your favourite Block Producers on the EOS blockchain. Currently, we have ranked them based on their current position and overall vote percentages. You may vote for up to 30 Block producers and we recommend that voters exercise the maximum amount to support their trusted BP candidates. You may also arrange Block Producer candidates based on votes and alphabetical order as well by clicking the name or votes tab on the voting portal. We have also installed an easy reset button in case you need to reselect the BP candidates you are voting for. In collaboration with Aloha EOS we have added a Proxy Information Table to allow proxies to register their accounts with background information that automatically is stored on the Aloha EOS smart contract. You can select your favourite proxy from the table and assign your vote to them directly from the toolkit. This table will help EOS token holders carry out their research when looking for the right proxy account that can vote on their behalf. From our table you will be able to gain insights into the philosophy and background of the proxy as well as search their accounts to see the total EOS staked and other details about their account. The proxy will have time to dedicate to researching, vetting, tracking every single existing and up-and-coming block producer candidate on your behalf. For more information on proxy voting check out our previous article explaining how to become a proxy. In conjunction with the team working extremely hard building out the referendum smart contract. We have been working on being the first to implement an easy GUI for users to create proposals and access referendum voting directly in the toolkit. This is a vital component in bringing referendum voting to the masses and we will continue to build out this portal to make it easier for all users in the ecosystem. Take a look at the roadmap for the referendum smart contract. Also, take a look at the first proposal put forward by EOS Tribe using our toolkit. We added in an account information bar to quickly and easily visualise the current holdings and status of the connected account. This gives you real-time updates of your account whilst you are enjoying the tools on the toolkit without having to check the status on a block explorer constantly. Once connected, your selected Account information bar will show up immediately. Remember to use these features you must install Scatter with your desired EOS Account. We would love to receive feedback on the features within the toolkit or suggestions on the features you would like to see added. We value your feedback and will keep working hard to be the number 1 online EOS Wallet.